The Adirondack Mountains create a stunning landscape for Hudson River rafting trips. The Hudson River, whose source is high in the Adirondacks, features crystal clear water and five hundred foot granite walls that will awe and inspire New York river rafters in between thrilling whitewater. The most popular run is the Upper Hudson River Gorge, and the Middle Gorge is a great whitewater experience when water levels allow. Located 4 hours north of New York City on the scenic New York Thruway (RT 28), 3 hours from Syracuse, and 4 1/2 hours west of Boston, the Hudson River Gorge is easy to access from major metropolitan areas. However river rafting trips in this upstate New York region are still very remote and pristine. Rafting.com is currently seeking qualified outfitters for Featured Listings. If you are a local rafting outfitter in New York and would like to see your company listed here, please contact us for more information. The Upper Hudson River Gorge is one of New York’s most popular and dynamic whitewater rafting runs. Flowing 17 miles through the Adirondack Wilderness, the Hudson River Gorge is an excellent choice for both novice rafters and whitewater enthusiasts. 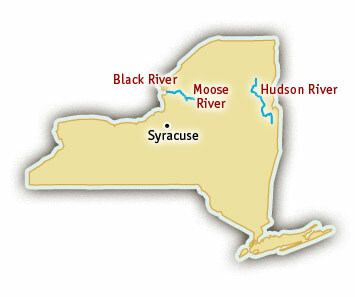 River trips begin on the Indian River, three miles above the confluence with the Hudson. The whitewater rapids, such as the Narrows, Givneys, and Greyhound Bus Stop, range from class III to class V depending on the season. Experienced rafters enjoy trips on the Hudson River in the spring, when snowmelt makes for higher flows and more difficult class IV and V rapids. 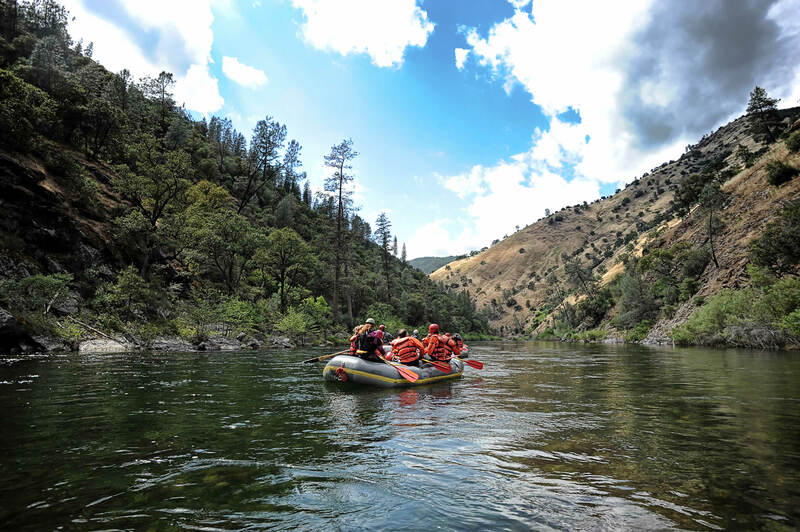 During the summer, the flows are dam-controlled, creating the perfect class III whitewater rafting experience for families and beginner rafting trips. Fall trips offer some of the most spectacular scenery when the famous New England foliage dramatically changes colors. The dam-controlled Hudson River rafting season is from April through October.